Chandos CHAN 10172 Disc, 63-page booklet, and packaging are all in excellent condition. Booklet, jewel case, and outer slipcase are notched. 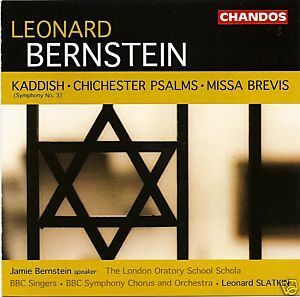 Bernstein: Kaddish/Chichester Psalms/Missa Brevis Jamie Bernstein narrator Ann Murray mezzo-soprano Simon Baker counter-tenor The London Oratory School Schola BBC Symphony Chorus Pablo Strong treble BBC Symphony Chorus BBC Singers BBC Symphony Orchestra Conducted by Leonard Slatkin This disc contains the premiere recording of the extended Missa Brevis and of Symphony No. 3 Kaddish with a new text written and narrated by Bernstein’s daughter Jamie, as well as the popular Chichester Psalms. Leonard Slatkin and the BBC Symphony Orchestra have so far released four discs with Chandos, all of which have been highly praised. The thoughtful programming of works on this disc provides the listener with a fascinating insight into Bernstein’s exploration of the nature of faith. The two major works on this disc are deeply rooted in the composer’s earthy, energetic and theatrical response to questions of faith in general and Judaism in particular. In contrast to the extrovert gestures of the Third Symphony and the Chichester Psalms, the expressive language of the Missa Brevis is more restrained. The work was prepared in 1988 when the composer’s seventieth birthday was being fêted across the globe. The more typical elements of Bernstein’s idiom â“ the jazzy brashness, the melodies, the excitingly vivid orchestral colour â“ are better represented in Symphony No. 3 Kaddish. The symphony was first performed in Tel Aviv on 10 December 1963, less than three weeks after the assassination of President John F. Kennedy, to whom this score is dedicated. ‘Kaddish’ is a Jewish prayer for the dead, but the work is far from mournful in content. It praises God, affirms life and pleads for peace. For the recited text in the symphony Bernstein wrote his own impassioned and highly personal prayer around the Kaddish. At a press conference after a performance in 1977, Bernstein expressed his dissatisfaction with the text he had written and which here appears in a new version by his daughter Jamie. The Chichester Psalms were commissioned by Walter Hussey, Dean of the UK’s Chichester Cathedral. When writing to invite Bernstein to compose the piece, Hussey confessed that he would be delighted if the score had ‘a hint of West Side Story’ about it. Bernstein must have taken this suggestion literally, for he lifted much of the musical material from pre-existing stage scores â“ not only from his most famous musical but also from the projected musical The Skin of Our Teeth.